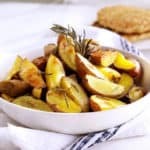 These oven roasted rosemary potatoes make for a tasty and delicious side dish that’s easy to make. Full of flavor, they are the perfect accompaniment for any meal! Preheat oven to 425 degrees and spray a baking sheet with olive oil cooking spray. 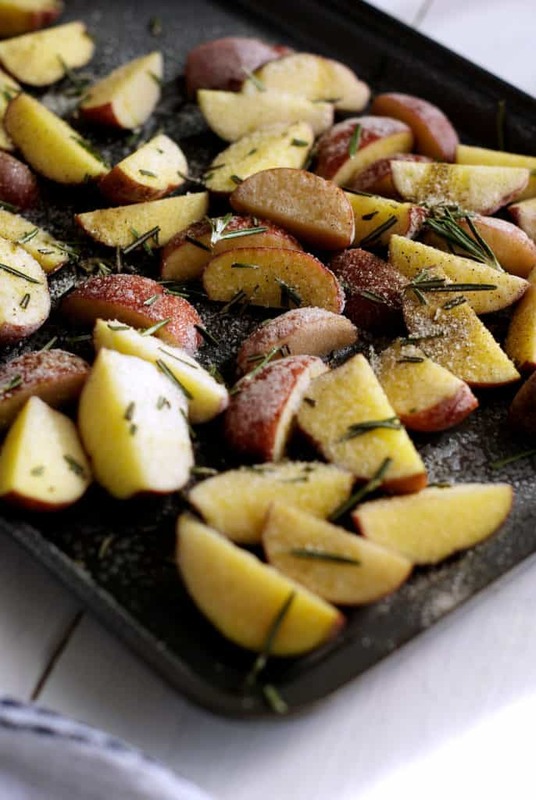 In a large mixing bowl, toss the potatoes with the 1/2 tbsp olive oil, salt, pepper and rosemary. Spread the potatoes out on the baking sheet. SBake for 45 to 50 minutes until the potatoes are golden brown, stirring every 15 minutes. Serve hot. Can oven roasted potatoes be made ahead of time? These will last up to 4-5 days in the fridge so you can totally make them ahead of time and enjoy them throughout the week. They are also a great option if you are making a big dinner for a crowd. Once they are cooked, cover them in foil, and then you can just reheat them when you are ready to serve. 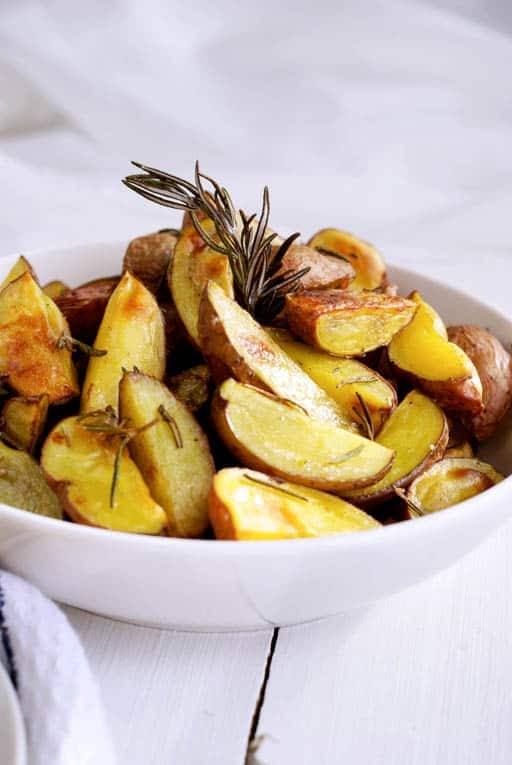 Are oven roasted potatoes healthy? Yes! I like to roast them with the skin on for added texture (and a fiber boost). Because these potatoes are oven roasted, not fried, they are less greasy, and lower in fat. Each serving has only 70 calories, and is vegan, vegetarian and gluten free. 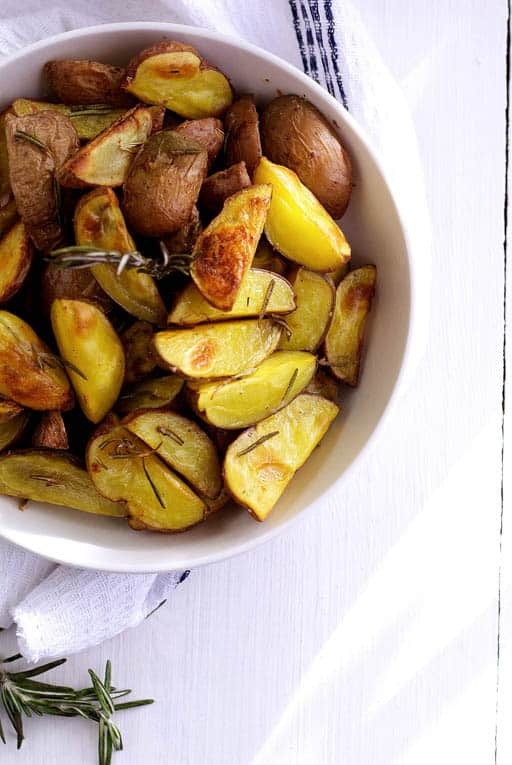 What herbs pair well with oven roasted potatoes? I love the classic combination of rosemary, salt and pepper most of the time, but you can easily switch things up and and add different herbs. Sage, thyme and garlic all work really well, and why not try chili for a bit of hit! Don’t cut the potatoes too thick too ensure they are cooked all the way through. Make sure the oven has been pre-heated before you put the potatoes in. Put the potatoes in an even layer on the baking tray, try not to pile them on top of each other or they won’t be crispy. The next time you make these, be sure to pair them with my Oatmeal Sunflower Pancakes for a tasty, healthy brunch, or even as breakfast for dinner! Oh and did I mention that kids love this too? 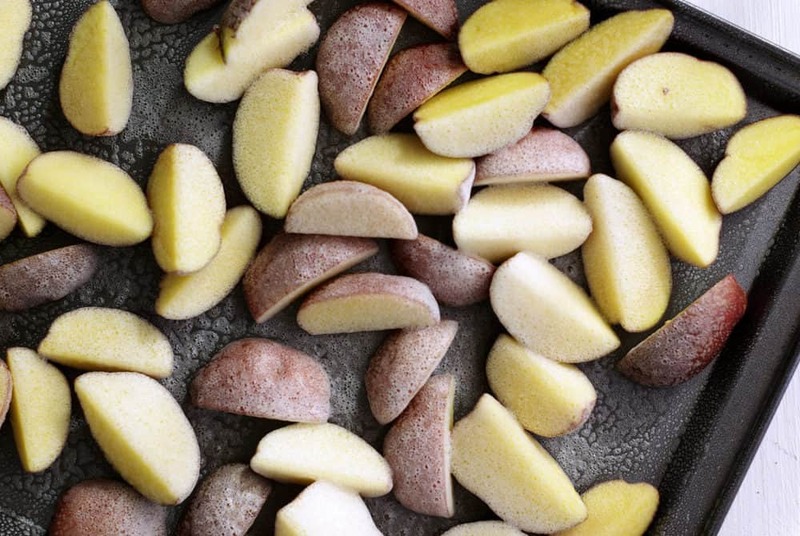 You can try it with sweet potatoes and root veggies (or a mix of sweet and regular potatoes AND root vegetables) to mix it up from time to time too! 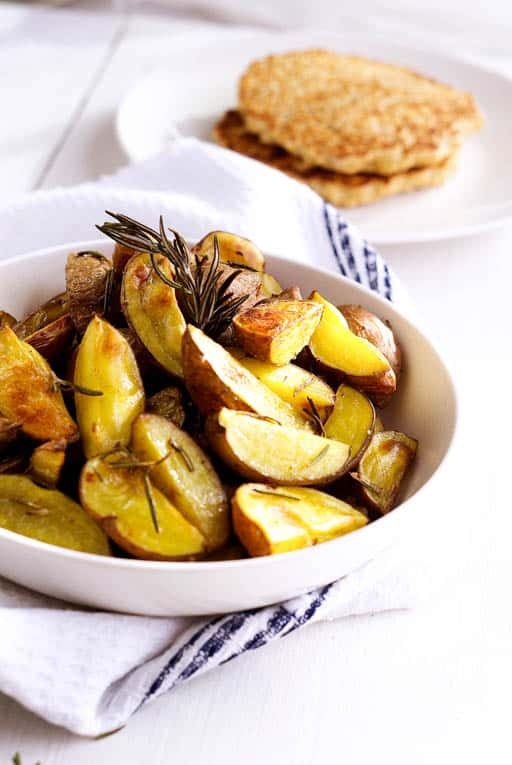 Be sure to try out these other healthy potato side dish recipes! 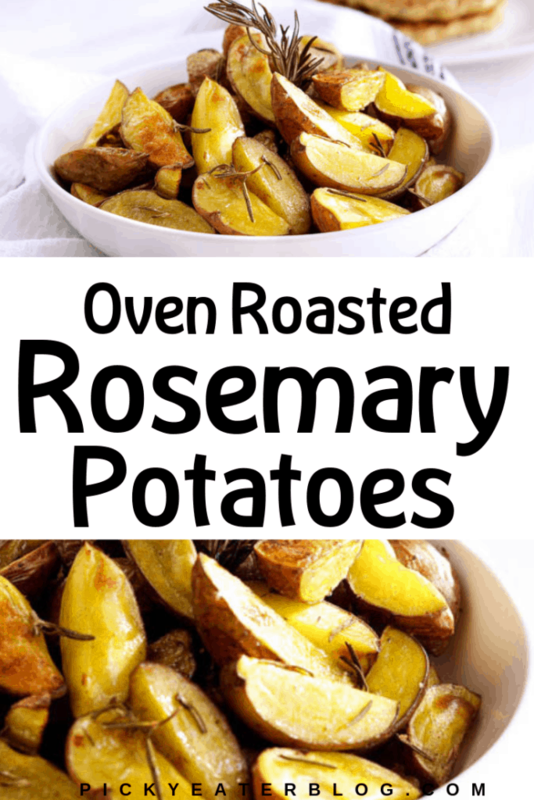 If you have tried this oven roasted rosemary potato recipe, or any other recipe on my blog, then please rate it and let me know how it turned out in the comments below! You can also FOLLOW ME on FACEBOOK, TWITTER, INSTAGRAM and PINTEREST to see more delicious, healthy, family friendly food! Crispy-on-the-outside and creamy-on-the-inside, this is the perfect side dish for breakfast or dinner! Preheat oven to 425 degrees and spray a baking sheet with olive oil cooking spray. 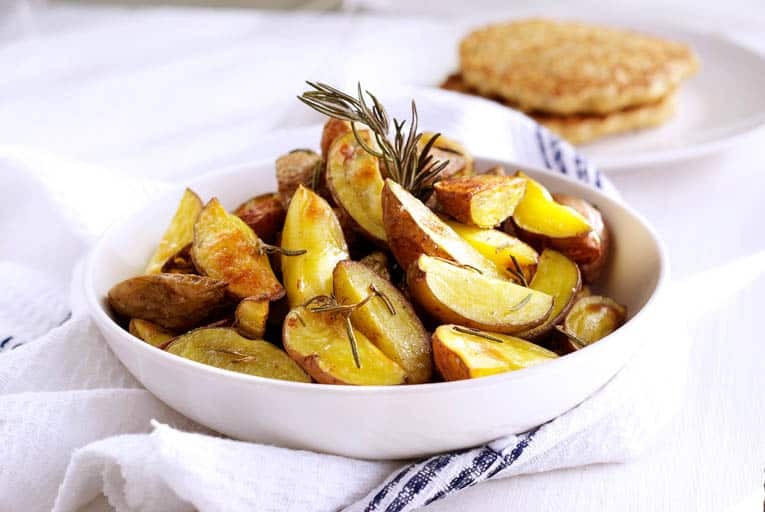 In a large mixing bowl, toss the potatoes with the 1/2 tbsp olive oil, salt, pepper and rosemary. Spread the potatoes out on the baking sheet. Bake for 45 to 50 minutes until the potatoes are golden brown, stirring every 15 minutes. Serve hot.